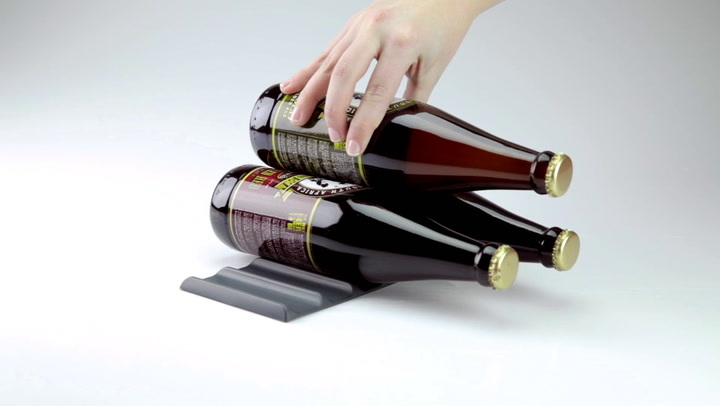 The Fridge Monkey is a simple, flexible rubber mat designed to help clear up the clutter in your fridge by stacking bottles and cans into a pyramid - it's clever design prevents them from rolling around and taking up space. Even when empty, the Fridge Monkey's low profile means is doesn't get in the way. Year after year, we receive reviews and comments from people who've tried it out and loved it. Interesting fact: The idea and name, Fridge Monkey, comes from 'brass monkeys' used on old warships to stack cannon balls. Drinks in photos not included with product. View more from Wedding Favours Collection, Gifts for The Gin & Spirits Lover, Fridge & Freezer Accessories, Wine Storage & Coolers, Mode. Suddenly my fridge seems so much bigger & more organised!!! And the beers, which used to roll around and take up so much space, have their own Fridge Monkey too!! Great as a present for a friend or yourself. Something everyone needs. I've got more than one Fridge Monkey, that is a review in itself! The Fridge Monkey is the ideal organizational tool to have in the fridge! I love that you can choose the colour to suit you but most of all, I love how it just works...perfectly! A definite must have! Whoop whoop, love this little monkey. YAY! I can finally open my fridge without risk of being injured in a bottle avalanche. This clever little monkey has my bottles all lined up and well behaved. I applaud you Fridge Monkey!